April 15, 2013 By Tina M 103 Comments This post may contain affiliate links. Read my disclosure policy here. My husband then proceeded to say: “Let’s say you come in from outside and take off your jacket. You then conveniently drape your jacket across the back of the couch and go about your next activity. Next, someone comes over and wants to sit on our couch so you quickly move it to the counter. Later you are making dinner so you finally move your jacket to your closet. How many times did you touch the jacket before you put it away? 3 Touches. Let’s say you come home, take your jacket off and put it straight in your closet…how many touches would that be?” He then excitedly exclaimed “ONE TOUCH!” And then he grinned as if he had just given me all the secrets to a successful life. So there you have it: “Keeping a clean house 101” straight from the mouth of my darling husband. It sounds a little “no-brainer,” but it really does take some training for my brain to learn not to just set things in a different spot where they do not belong. It also takes a deliberate effort to make sure all of your belongings “have a home,” a place where they belong. Also, stop by houseoforder.com. My friend Marie Ricks updates her homepage every day with a daily cleaning task that will keep your house “up to par” year-round. If you’re anything like me, I’d much rather have a daily cleaning schedule and spend 5-10 minutes a day (sometimes less) doing one extra small cleaning task than spend two weeks spring cleaning! UPDATE: it looks like she stopped blogging, but she has some amazing tips in her book Organize as You Go. Or you can read my post on Time Management where I list all of the best ideas that she taught me (she helped me overcome my laundry problem). That woman is an incredible organizer! My other favorite tip for cleaning is using microfiber cleaning cloths! I went to a Norwex party once and was so thrilled with everything the magic cloths could do WITHOUT using harmful cleaners, but felt the products were a little pricey. Fast forward 5 years later, I have made the switch to Norwex products with almost everything. The cost is made up for in what you save by not having to buy cleaning products and other things like paper towels, etc, and other microfiber cloths I tried just didn’t compare. I have since ordered Norwex for cleaning everything in my house and I love the products. See current Norwex sales here. What are your tricks to keeping a clean house? Make sure and stop by our main Home Organizing Hub for lots of amazing ideas! Your husband is clearly brilliant. If I could enact this strategy, I would wager I would cut my cleaning time in half. Now if only there was a one-touch rule for toddlers, right? I’m in favor of a zero-touch policy for junk mail. That is, call, email, or visit their website and tell ’em to quit sending it. In the US, contact the Direct Marketing Association and do a credit card opt-out first, then individually contact catalogs, sales circulars, and the like. Seems to work for everything but real estate flyers and political mail in election seasons. There are many guides online with details on getting off of junk mail lists. Hey Betsy, I got so tired of how much junk mail I received. That first I did the whole opening them all and changing around what went into the envelopes. That did “NOT” work. But what did work was easy but you have to stay with it. In a few months time I was receiving less then a fourth of before. So here is what has seemed to work. While your just watching TV etc., open each envelope and take anything with your name out and write in very large bold letters. “Remove my name from “ALL” your mailing lists! Then put that inside the envelope they provide and use their postage to mail it back. If I see another piece of junk mail from the same company I do as before but at the end of the request I sent before I write “Second warning!” And as I said before My junk mail is very little. In my state if you warn an aggressive mailer twice they are breaking the law if you have warned them twice. Two regular habits I use. #1. For every item I get out, I put two away. #2 every room I enter I put two things away. Ha ha there is no one touch rule for toddlers, but there is the one finger rule. I was so glad a friend of mine taught me this when my children were babies. It truly works! Toddlers need to explore their environments, it’s how they learn and open up their worlds. They have to touch everything, and that is how things get broken, knocked over, etc. Touching things with their pointer finger allows them to explore an item, feeling the texture, etc.. without breaking or damaging it. One finger touches are gentle. I remember one time when my oldest was in a stroller in the China Department at a store with me while I was getting a wedding gift I noticed that the help was nervously eyeing him in the stroller thinking he was going to grab stuff off the shelves. The one finger rule was in place. He touched with the one finger, and not an item was moved on the shelves. He was happy, I quickly was able to find the gift, and we were on our way, after getting praises from the store staff about how well behaved he was. They can’t shove crackers into electronics around the house if they are using one finger. Of course I would move most items up until they were a bit older but not all. The one finger rule too cuts down on finger prints everywhere too via grabbing. Recognizing they have to explore and allowing that in a safe manner allows them to do what they need to do and you to be sane at the end of the day. Actually little ones too, if they can walk, are able to put their coats, etc. away if they have a kid sized environment. Getting them to do this is as simple as a smile, and a very friendly “thank you! you are such a good helper!” Ha ha, it’s the older years where it gets harder, but by then with good habits it will be natural to them. What is the one finger rule. I have A 14 mo old. I love this, we grew up with Everything has a place and everything in it’s place. I’d like to say I was a pro at that but not so much, although with age I have gotten better. To help keep my hose tidy on a regular schedule I always clean as I go no matter what I’m doing. Walking from the family room to the bedroom, I find a way to pick up or tidy as I go. Felicia I agree with you…I’m always cleaning as I walk around my house. And everything must have a home. Great idea and so simple! The link is broken to the daily cleaning tips… any help with that? I had eight children our house rule was ” Don’t put it down-put it away” -this helped a lot. As soon as the girls could walk they started putting toys away in the basket. They couldn’t play with another toy until the one they were playing with was back in the basket. it was a game at first then became habit. They do the same with their children. My other rule was ” When finished put it back in it’s place”. We had hooks on the wall for their backpacks and 2 benches for shoes to go under. And several other things to keep everything running smoothly. I raised my girls alone for years after my husband died so between working and keeping house cooking and laundry I had to be creative with how I did things and my time. cclarkacres can you pls teach m lol? I’m a single mother of 6 and need all the tips I can get! Yeah, my husband is tidier me. Glad I’m not the only wife that goes through this! Same here! Sometimes I worry if I stand still too long, maybe he’ll declutter me too haha. 15 Minute Rule~ Every night before going to bed, Everyone picks up for 15 minutes. This teaches little ones from an early age to be organized and responsible. I was always surprised just how much could be accomplish in 15 minutes. No matter how tired you are, it is refreshing to wake up to a more organized living space. All of the submitted rules really do work. We do this each night after supper. While I do dishes, put away leftovers and clean up the kitchen, My husband tidies the bathroom and bedroom and my son vacuums, takes out garbage or whatever else needs doing. In 15 minutes the house looks great and we can relax and enjoy our evenings. Such a great idea Kelli! What to do when the husband is the messy one, who likes to cook while experimenting with every pan in the house, as well as every cupboard door or drawer, I need to wash my cupboard fronts at least six times a year. not to mention holding my breath to keep from blowing my cool. Meet my husband, with his stash stored everywhere, no surface is allowed to be clean for 5 minutes. I need to live in a house with vertical shelves. I do explode at him and he runs and cleans for about 1/2 hour and then forgets all about it. Even though he drives me nuts, I think I can survive better with him than with someone who is so uptight that nothing can be out of place. I have a messy husband too. I am constantly telling him to wash his hands, as he tracks food onto every surface he touches, so I end up cleaning handles, and vertical surfaces often. It is difficult, but I love him. I try to make him put his clutter away, or else I place it somewhere he will have to deal with it (like his side of the bed). That works! Awesome. It’s on! Somebody pray for me. we just moved my daughter in her new apartment and there was a place for just about everything but a few thing like the bathroom so i made a no home box and put the oide thing in side of it and told her to check in there first before you go and by more. also a no home box for the desk stuff she has paper for about 2 years. oh and 1 more for the apartment extension cords, lite bulls,drawers liner ,etc. i just hope it works for her. it works for us at our home i put the bathroom one in the bath towels shelf and the one for the apartment in where the washer and dryer are on a shelf and the one for her desk out side in the storage closet. just 3 no home boxes. i’ve just put that on my white board about my desk, i will be going to ‘ohio’ now to keep home clutter free!!!! i have no problem doing this as I do it every single day, now if I can just get my bf on board, my life would be much less stressful!! he NEVER ever puts anything back where he gets it from.. hence my coffee table is always a cluttered mess until I get home from work and put everything up.. it is really annoying.. and it does no good to keep telling him constantly.. he knows what he’s doing, but for some reason he just never feels the urge to put anything back where he got it from.. but I won’t give up, one of these days he will help me keep stuff put up or it will end up outside in the trash!! lol.. glad I keep all my stuff put away..
Haha! Amy, hang it there! Habits can be challenging to reverse, especially when it’s one that’s been there all your life! Keep it up. He might be inspired eventually! I was really annoyed by my hisband’s “one touch rule” in the beginning, but now I love that he’s so good at it! This is what works for me: Have you ever noticed that when somebody calls to say they will be dropping by in an hour (or 15 minutes) you can suddenly see everything that needs to be put away, in order of importance? Just pretend your mother-in-law or child’s teacher is on her way, you will notice things you’ve been ignoring for days. I walk into a room and look at it as though I were a stranger visiting. Its amazing the things you can look at everyday and not see! It wakes me up to the little things I may have been overlooking because I see it every day. My life is made up of a million touches.. Thanks for this- let the brain training begin! I have to laugh since my husband had just told me this earlier today! I love the one touch rule! Thanks for sharing! My husband used to lecture me on “everything has a place and in its place it should be placed”…that is until HE misplaced something and I got to lecture him! He has since changed his tune! HA! This has been my rule all my life. I am married to a wonderful man who – even after 37 years – doesn’t get it. He sees that coat draped over a dining room chair as convenient since he’ll be going out to get firewood again…some day. He’s much better now than he was 37 years ago so that’s a good thing, right? For him, I think a lot of it is an ADD thing but I spend an enormous amount of time picking up the pieces Tornado Terry has left behind. Thankfully, two of our three (now adult) children learned their lessons from their momma and only one of them is Daddy’s (un)cleaning clone. Thank you for the post…it helps me help him when I can show him that others think the same way I do when it come to clutter and cleaning. When I get aggravated about THINGS I remind myself how much I love him and what would I ever do without him. These THINGS don’t seem so important anymore. Yup. I fell in love with the man I married 3 years later when I was just turned 17. That was almost 41 years ago and I fall in love with him again and again each day and I’m thankful he loves me right back. My husband also has the heart of a servant and spends most of his spare time doing for others. Our 38th anniversary is in a couple of weeks but that love doesn’t mean I am blind to his uncleaning gene. I roll my eyes (to myself) and pick up after him and just go on as I need to. It is nice to know others have the same thoughts about cleaning and only touching once as I do even though it seldom happens at my house if my beloved is involved. Oh my God! This is brilliant! Seriously, tell your husband he has just opened my eyes. I am by nature a clutter freak who yearns to be a neat freak but has no clue how to do it and break the family cycle I came from and am teaching my children of chaos. I am going to post a sign on the refrigerator as a reminder. My husband and I are in our 50’s….we still have to remind each other…..if you are going to walk from here to there why don’t you take something with you? Married almost 42 yrs, I have to remind him constantly about that. He just doesn’t get it. He’s a good man but, he thinks it’s nagging and if I want it picked up I should just do it. He likes clutter near him around him, I don’t. Beds made. Dishes done,floor swept before we leave. (first time to your blog ) great tips , and fun way of saying it . nice newlywed advise . I have 2 teen girls ( I’m done the teaching years) they struggle to remember to put things away. I have three ” landing spots”, one for each level of the house. when I leave a level I look to that spot to take some things along as I go . we have a family of 5– I love this rule. I firmly believe everything in a house ought to have a home and a purpose. No home– totally in the way of ALL the things that have both! Way to go to your HUBBY! Haha, he says thank you! Why would you want to avoid cloth diapers?!? They’re awesome & so cute! My husband tries to make the bed while I am still in it! I think finding a place for everything is the hardest thing to do. It’s too funny to read all these comments about the neat husbands and those who aren’t. I love the one about the woman saying her husband tries to make the bed with her in it! I could write a book about what goes on in this house. I even went to therapy to learn to live with him, as I was the one with the problem: He was happy being surrounded by debris, whereas I couldn’t stand it. Believe it or not, therapy helped me learn to get along better with him and helped me to focus on the good parts of him. I need help. I am physically unable to keep up with my housework anymore. And forget the yard. For the lady that said she needs help, most states have a help line (211). My husband is exactly the same and it has made me a better house keeper but the only problem is when I have something out in fixing to use and he puts it up!! Happens all the time and drives me nuts! This is a really smart tip! Please, please, triple please learn the difference between “you are = you’re” and your (belongs to you)!!! I will fully identify myself as I am not hiding. Great post by the way! I’m definitely going to try this! Great habit to follow, unless your home has a basement plus three floors. My knees absolutely could not survive the amount of stair climbing involved if I only touched things once. Hi Tina. Just saw this blog about 1-touch cleaning. Your husband and I have the same concept. But just as you said, there must be a place for the items to make them one touch. My husand and I raised six children; we had two dogs and my mom living in the house with us and only one bathroom. Thank goodness it was a five-piece bathroom. I had to have rountine. It worked wonderfully, as I taught the children what to do. Of course it took a while to get the routines in their heads. (Kids). But once I did, my home was always clean at the end of the day unless something like a big dinner took place. Do you know about have a sink of dishwater when cooking? My mother taught me that decades ago. When I am finished cooking meals, there are only a few utensils left to wash besides the dinner dishes. I like the way you told that story, must be a nice person! I daily clean the toilets which completely eliminates the ‘bowl ring’ issues! That comment about tornadoe Terry had my hubby n me laughing till we cried! Live this blog. Great tip! I try to do this “most of the time.” But it’s hard to get my husband and teen son on board! Thank you!! Your sister’s advice to FINISH was a life changer for me. It was exactly what I needed to “read” at the time. Every alert of a ping went on in my mind and has been a total game changer in my life. Thank you both for such wonderful advice!!! Hi Amanda! With all the negativity that goes on in the world, we don’t need to add to it by criticizing others on the internet. I have deleted your comment, as my blog is a happy place to mothers to encourage and inspire others. That’s totally okay that you don’t like my blog, there are thousands of others out there for you to enjoy! Happy Holidays! Excellent advice to keep your negative comments to yourself. In that regard, when you see someone working.. maybe sweeping the store or straightening shelves, compliment them that they are making it look nice. I love your tip Finish what you start and sticking to one area at a time til it gets done, I am inspired to tackle my desktop in the morning (it’s 1:55 a.m. now) but I’m already getting started. Thank you for the motivation to accomplish a lot by doing a little at a time! A Great Way to combat the nagging, make a game of how many things you GET to touch just one time. Great ,my rules,use your eyes save your legs and take it with you,it is so easy then you can find ‘it’. I was so surprised to see this in a Pinterest e-mail today. I am working on decluttering my home. The last few days I kept hearing in my head, touch it once & began to do that. It is a great way to keep things picked up! 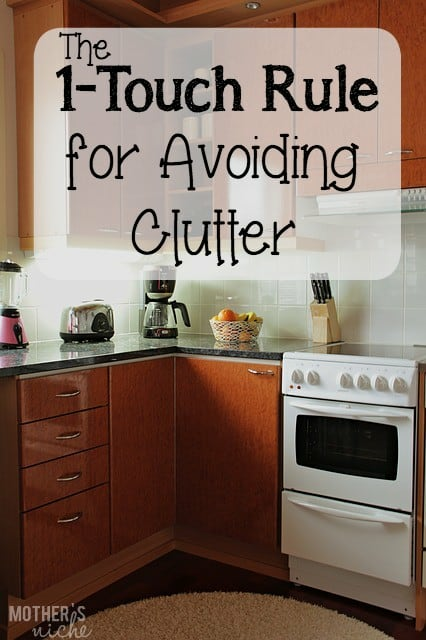 My husband is constantly nagging me about the clutter and mess. But when he helps with the kids, etc he just throws their things on the floor. Now there’s just so much “kid” clutter I don’t know a difference who’s is who’s mess and no one will fess up. 🙁 I like the “one touch” idea, maybe I can teach the kids. Diane H I have always lived by the 1 Touch Rule/OHIO and having a place for everything. I am married to a wonderful man that does not pick anything up unless I point it out but I usually need to wait a day/weeks or months until he does it depending on what it is. I like the idea of putting everything in a basket (I’ve done this before and the box sat for 10 years!) so I may now do same but change it up a bit. I am thinking I need to pile household tools etc. in a basket and tell him I’m putting it there until I can put it away but no promises when I can do it. So if he cannot find something he will know where to look. Any thoughts on this approach? We are now in our retirement home and I would like to somewhat retire from his mess! OMG I was smiling thro your whole article. My husband is also a little ocd and he has been saying that for years. ( I’m a little thick headed) now we have two kids and the clutter is intense. I guess I should get to trying it out.? Love the one touch rule. Wish I could get my husband on board, lol! My house is organized and always clean, every item has it’s place. In fact, someone said you could eat off my floors. It took some time for me to concede to my boyfriend, and not organize our junk drawer. He said, that’s why it’s called a junk drawer. However, I have one big problem, and I need help, all and any help. I cannot control or contain, my mail. I have piles, before I tackle it. I’ve tried throwing out junk mail as it arrives, but that last about a week. I’ve tried sorting once a week, but that’s another short fix. So, please can you help. When first married (almost 40 years ago) my husband would leave his “whities” where he took them off. After a few weeks of picking them up for him, I washed them and “hid” them in one of my drawers. He panicked one day when he had no “whities” in his drawer. Told him I washed everything in the hamper. Problem solved. He’s allowed to maintain his office and the garage how he wishes; he helps keep the rest of the house tidy. 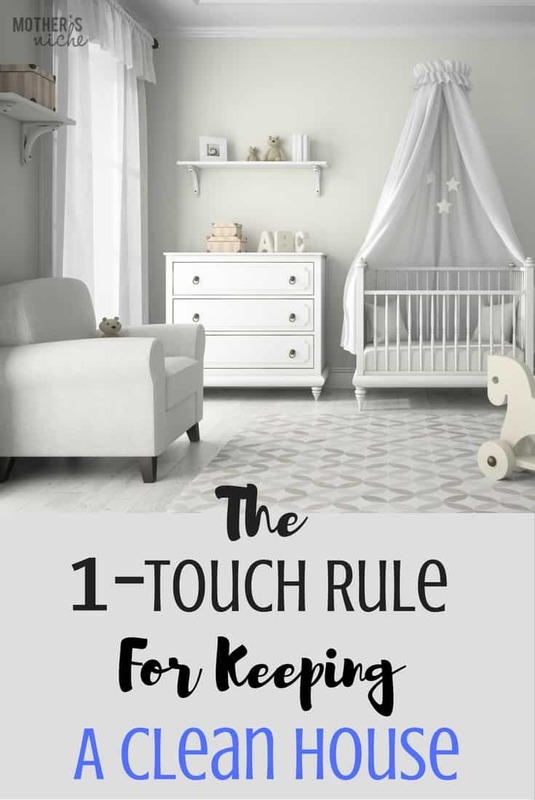 I love the idea of the One Touch Rule. A comment regarding Norwex and E-cloths. I don’t know anything about the e-cloths, but I am a HUGE fan of Norwex. Do the e-cloths have the same guarantee as Norwex? And by buying Norwex products on Amazon, an independent business person loses business. I have both friends and a daughter who sell Norwex, and it is an incredible company that takes good care of it’s consultants. A Very interesting website, thanks for letting me in. I notice that you say you are six foot tall. Foot is the singular for measurement and feet is the plural for measurment. So, you are six feet tall. Six feet is unusually tall for a woman. Have you had many comments about your height over the years, both nasty and complimentary? I am six feet six inches tall male (1.98 metres, I live in France) and I have had so many comments over the years that if I had a Euro for each of them I would be quite wealthy. Have a nic day, and please don’t let my comments to you about singular/plural measurement upset you. Have a lovely Sunday. I had to laugh…my husband just said the other day, “Margaret, let me explain the one-touch rule.” Now we’ve been married 52 years and he must have mentioned the OTR at least 52 times! I really do try, but my main problem is I’m sort of ADD and want to move on to another project as fast as I can, and never mind the drafts, envelopes and unfiled just-printed recipes that adorn my desk. Oh, well, maybe it’s the love of eating peanut butter out of the jar!! Those “a place for everything and everything it its place” types are real cocksuckers. I was so glad to see your post. After 12 years of marriage, my husband finally said he has o.c.d. all this years. He wants me to keep the house more tidy. I have been having a hard time to meet his demand, as I have a full time job in the hospital and have a kindergartener that has lot of health issue since a few months old. I barely have time for myself, not to mention keep up with all the house chore.